The Spanish style Dark Emperador Double Ended oval tub is a freestanding elegant addition to your bath. The marble is self is beautiful. 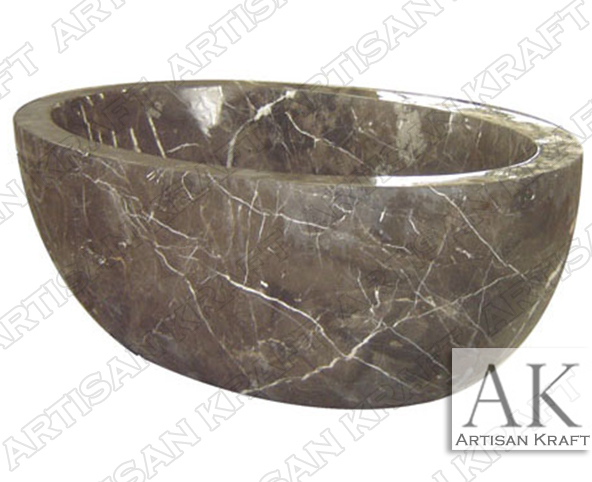 A rich stone light brown color with white veining. A wide rim oval designed modern style bath tub. The stone it self is a style statement. Add this to any bathroom and it will class it up. Add a pedestal, change the size, include a soaking side to customize to your needs. Artisan Kraft stocks fireplace mantels as well as some freestanding stone tubs.